How do I add images to Imagisizer? You can Drag and Drop Files or Folders onto the Imagisizer interface. You can also click one of the Browse button's to search your computer. Where do my newly Imagisized images go? By default they go into a folder where the original images are located and they will be labeled by the size and type selected for the newly Imagisized images. You can also select an existing folder or create a folder you want to use. How many pictures can I Imagisize at a time? Really, how easy is Imagisizer to use? 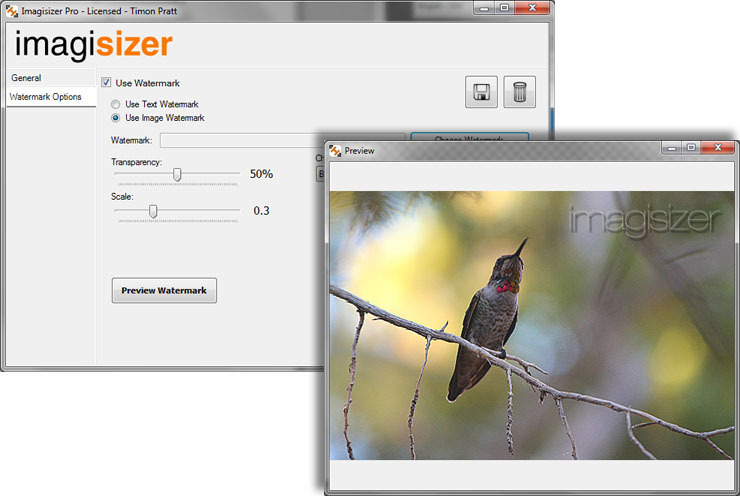 Imagisizer, compared to any other Image resizing software is by far the easiest to understand and use. Can I resize & convert whole sets of images to multiple different sizes & file types all at once using Imagisizer? What image files types are supported in Imagisizer? What Operating Systems can I use Imagisizer on? Imagisizer works with the following Windows Operating Systems: Vista 32bit/64bit, 7 32bit/64bit, 8 32bit/64bit, 8.1 32bit/64bit, 10 32/64bit, Server 2008 32bit. Why do I need to resize my pictures? The pictures that come out of a digital camera are too big for use on the web. Websites often have two requirements for uploaded pictures: a maximum height and width and a maximum file size. 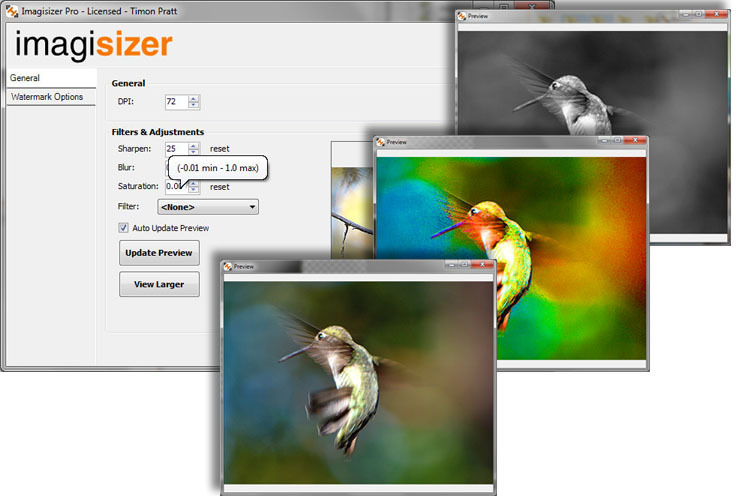 imagisizer alows you to change the dimensions of your picture and the file size. You can adjust the image size and the quality setting to ensure that the resulting picture meets your requirements. How does the image quality setting affect file size? The image quality setting of your JPEG, PNG, GIF and BMP photos has a large effect on the file size, with reductions of 50% or more possible with the correct setting. A low setting for image quality will give a smaller file size. A high setting of image quality will give a large file size. The trade off is that if image quality is reduced too far, your photo will start to look degraded. In general, an image quality of 70-80 will give a massive reduction in file size for most images. Imagisizer can display your photos at various quality settings so you can choose the best balance of quality and file size. Can I make my pictures bigger? 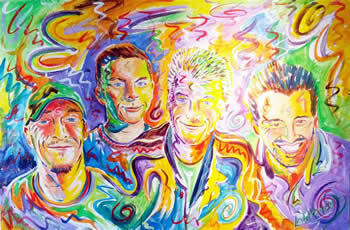 Making a picture bigger will make it blurry. Unfortunately, software you see on TV shows that can zoom in on a small part of a photo and turn it into a sharp, detailed image is mostly make-believe. You can increase the size of your picture a little and it will still look ok but a large increase in size will deteriorate the image. If you want a larger picture, upload the original file that came from your digital camera and resize it down. How big should I make pictures for email? About 400-600 pixels wide and/or high is a good size for email. This is large enough to properly view the image, yet has a small enough file size so that it doesn't take too long to download and view. Any bigger than this and it may be too large to fit on the screen without scrolling the page. If you have a question that isn't answered here, please use the feeback form on the contact page to get in touch and we'll be happy to answer any queries you may have. Or indeed if you have suggestions of features you'd like to see added to the software we'd like to hear from you as we are continually looking to improve and perfect this product.